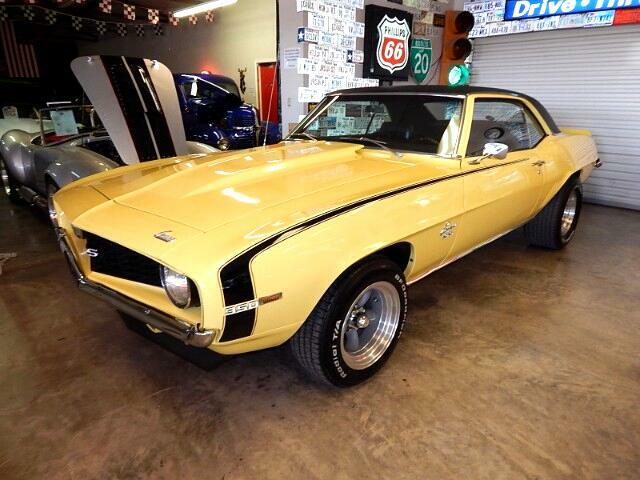 Lone Star Muscle Cars is proud to present this super nice 1969 SS Camaro Tribute. Powered by a fresh 350 Chevy motor with a 4 speed transmission and 3:73 posi rear end. This classic muscle car drives like a '69 shoulder. Inside, you'll find the rare factory front kick panel speakers. If you're searching for that old school look, this is it with the gray on chrome staggered wheels, dual exhaust system and much more. All correct SS stripes and badges. This classic car has the Daytona yellow and black top rear spoiler. This car also comes with a ton of parts. Call Ernie for more information, 940-733-4599 or 940--691-1070. Message: Thought you might be interested in this 1969 Chevrolet Camaro.